Neutrinos are in a class of their own even in the elusive world of subatomic particles. Not only are they the fastest, neutrinos can pass through anything—from superdense galaxies to imploding stars several times the size of our sun. 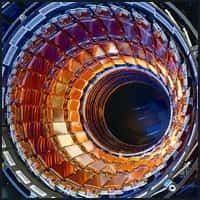 Recent findings at the Cern, the European Organization for Nuclear Research, published in Arxiv, an online repository of physics research papers, on 22 September, suggest neutrinos may have surpassed the speed of light, that most inviolate of constants in the Einsteinian universe. Nothing can exceed the speed of light, according to Albert Einstein’s theory of relativity. 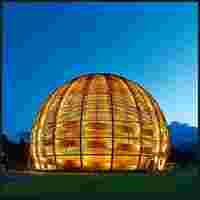 If the Cern results are repeated and validated, and neutrinos are indeed found to travel faster, modern physics may have to be redefined. This is perhaps the appropriate time to look back at the history of the neutrino and how it may have caught up with the imagination of science fiction masters, who have, in their multifarious universes, conceived of faster-than-light (FTL) travel and what it means for humanity. ‘Faster than light’ may be a possibility? 1987 : Light from supernova the neutrino. SN-1987A, which exploded 168,000 light years away, reaches Earth. As many as 24 neutrinos are detected on terrestrial machines astronomy is born. 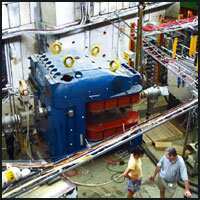 2000 : Scientists confirm the existence of at least three kinds of neutrinos—electron, muon and tau. When neutrinos blitz through space, they often morph into these forms. It is thought there might be eight types of neutrinos.